VELCRO® Brand Qwik Tie Tape & Straps: self-gripping fasteners that are ideal for cord control and cable management applications, especially those that don’t require the durability of our ONE-WRAP® brand fasteners. 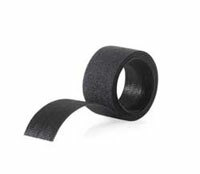 These low profile straps and tape are a perfect fit in small clearance areas. Reusable, adjustable Qwik Ties are available in a variety of lengths, strap configurations, and roll sizes. Applications: Fiber Optics, Packaging, Cable Management, Wire Harness, Appliances, Medical Devices and more. Our stock offerings are below but if you need a custom configuration call 800-635-5252 for details.